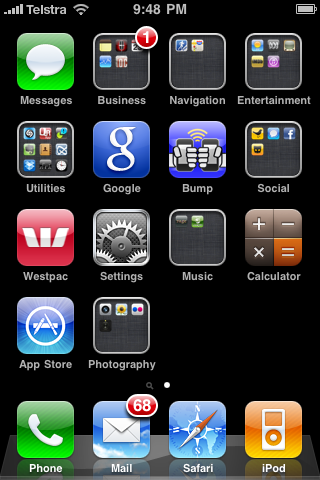 After some inspiration from Kim and some assistance and advice from Sophie, here is my iPhone home screen post. I guess it is really another meme post. A few days ago I managed to install the ios4 operating system and Sophie told me how to put everything in folders. My folders seemed to pick up labels based on what application went in first, but Sophie has since told me that I can change their labels. I’m very fortunate that my iPhone is provided by my employer. Before I was given this phone early in 2009, I had a Palm Treo. I liked the Treo but found the plan I was on very unreliable and once I had used the iPhone for about a day I realised that the Treo was really a very clumsy device. The early Palm PDAs worked really well and I never went to a meeting at work without them. Then they changed to a Windows mobile operating system and everything went pear-shaped. One of the attractions of the iPhone is that “you already know how to use it” (as Apple says about its iPad). It is a very intuitive device. And, as I work in a university, if there is something I cannot figure out, I just step out into the Library and ask a student. So by now you’ve probably realised that I don’t have that many applications on my home screen. There are a few things I never or hardly ever use, like some iTunes U sites I was looking at, Stocks, iTunes (but I use that on my laptop), Shazam, RunKeeper, Ping, Evernote, Contacts, ShapeWriter, Dropbox, YouTube & Safari (I really don’t browse the internets much on my phone) and BlockChalk. Mail – to check both work email and Gmail. I find it very reliable. I’ve got “Fetch” switched off because it was really expensive on data when I was overseas. I found that it is just as easy to download email when I want to check it. The Maps app is also data hungry, especially when you are moving. iPod – I LOVE my iPod. This is my fourth iPod and it is a bit problematic as they all have different libraries now. This one is nearly full, but I listen to the music whenever I can. I think I have about 3-4 sets of earphones that I use regularly while walking, o the light rail and in bed sometimes when reading. I think iPod has been directly responsible for me buying much more music over the last 5-6 years. Rage – I use the Rage app almost every weekend to see what is on and to set up my music video recordings on ABC TV. It is brilliant app that allows you to browse all clips broadcast each night and it has a great little fave feature for both songs and artists that collects your list for you. I also use Unearthed (a Triple J app that allows you to download and fave new music). I get app upgrades from and sometimes search the App Store. I’ve used Bump occasionally, but wish I could remember to use it more to swap contact details as it seems an awful lot more sensible than swapping business cards these days. I sometimes use the Facebook and IMDb apps when I feel I need to, but they’re not top of the charts. I look at Weather quite often (to help me decide whether to run, ride or catch the light rail to work), but it isn’t reliable nor very informative, so if I really want to know what might happen I usually look up the Sydney BOM forecast on Safari. The Westpac app is excellent and I do use it occasionally. So too is Google and I’ve used the voice search feature very accurately when trying to find a bike shop with grubby hands after running out of spare tubes after a flat on my pushy. Probably my most used apps are TweetDeck and Echofon, both for Twitter. They now live in the Social folder along with Facebook. And no, that isn’t Grindr there with them. Well it might be, but only because Stephen Fry talked about it on Top Gear one night. I only read the articles.